In a bold attempt to remain ascarbon neutral as possible – while still having one heck of a fun, family, fly-and-drive holiday – Mandy Blake has taken on a virtual emission impossible. AT traces her carbon footprints to seeif she makes even the tiniest misstep . . .
Staff manning the counter at the Maroochydore Virgin Blue counter for the 11am to Adelaide didn’t bat an eyelid when I tried to check in two suitcases, a pram – and 670kg of carbon gas. I expected a lecture and a $5176 excess baggage bill at the very least. But nothing, nada, not a raised eyebrow. That’s because that pesky carbon gas is an unwelcome and invisible sidekick to every traveller, anywhere, packing on the kilos with every mile. But even in this time of carbon trading schemes and soaring fuel costs, it’s still hard to weigh one’s wanderlust against the environment. The whole conscience concept is a bit of a travel killjoy. After all, aren’t holidays supposed to be fun?So is it possible to travel sustainably and still have a good time? With my chosen trip the most maligned carbon culprit on the domestic scene – the petrol-burning, takeaway-inducing, carbon-belching fly-drive format, this time from the Sunshine Coast to Adelaide to Melbourne via the Great Ocean Road – I’m about to find out. There’s nothing like long drives along sheercliff faces to burn fuel. And just to make it extra tricky, let’s throw in a consumption black hole called a three-year-old girl (“I want a Bob the Builder juice and tomato chips now!”) and a partner who believes environmentalism is “one big scam”. Marital relations are saved once I explain that only a few harmless rules will dramatically reduce our trip’s carbon footprint. The most obvious environmental cost is the carbon belched out in the actual travel. According to Greenfleet Tree Totaller (www.greenfleet.com.au), flying from the Sunshine Coast to Adelaide then returningfrom Melbourne will cost about half a tonneof greenhouse emissions. Driving a Toyota Corolla from Adelaide to Melbourne overfive days will notch up about 180kg in CO2and cost about $127 in petrol. Renting an electric-petrol hybrid Toyota Prius costs almost double – but emissions will be cut to 106kg,with a fuel cost of around $73. I also pay Greenfleet $9 to plant three trees to offsetthose emissions, the charity’s recommended number. Nine bucks seems a bit stingy, soI buy some extra green grace in the formof five more trees for $15. The travelling part is harder to attack since it’s fraught with hidden eco-traps. A few rules are set to limit waste, water and greenhouse emissions, including vowing to buy local, shunning souvenirs, eating in instead of taking away, avoiding bottled drinks (alcohol, of course, exempt), avoiding excess consumption (alcohol, of course, exempt) and reusing hotel towels and linen when practical. We three board our flight with reusablewater bottles, pre-packed snacks in recycled biodegradable bags, and clear consciences. We scoff at lesser mortals paying good money for their bottled drinks and over-packaged chicken wraps, then smile condescendingly as fellow car renters get into their six-cylinder gas-guzzlersat the Adelaide airport and drive away, leaving behind them trails of gaseous poison. And then we take a close look at the Prius key chain. There’s no key, just a small black box and an oxy-moronic instruction manual that says to put the key in the keyhole. What keyhole? Oh, the one that looks like the place to store toll change. I guess pushing the power button might help, yes, but how do you start the bloody car? Um, try every button and pedal . . . yes, the dash turns on. But there’s no noise, just a small screen saying the car is ready to drive. But how do you make it move? And why is the car park attendant doubled over in pained laughter instead of helping? Ah, so if “D” is for drive, what doesthe “B” stand for? Okay, I will be bold; I can’t hear an engine, but if I push this pedal, and lift this, and punch that – oh, crap, we’re moving. But I can’t hear the engine! Rule No. 1 should have been: test-drivea hybrid before embarking on an eco-trip.We never do discover the exact combinationto start the darn thing, so we perform thispious Prius pedal dance every morning forfive days, accompanied always by the mocking laughter of hotel car park attendants. In Adelaide, our eco-sins remain low, untilwe face the prospect of showering in a mould-infested ensuite in our overheated room. It’s so gross; we spend our towel allowance lining the bath-shower to prevent our toddler slipping on the oily, mouldy, smelly floor. We flee at first light, telling the sat-navto calculate the most efficient route to the Barossa, and find ourselves crossing dirt tracks through lush pastures and extraordinary displays of the breaking spring. 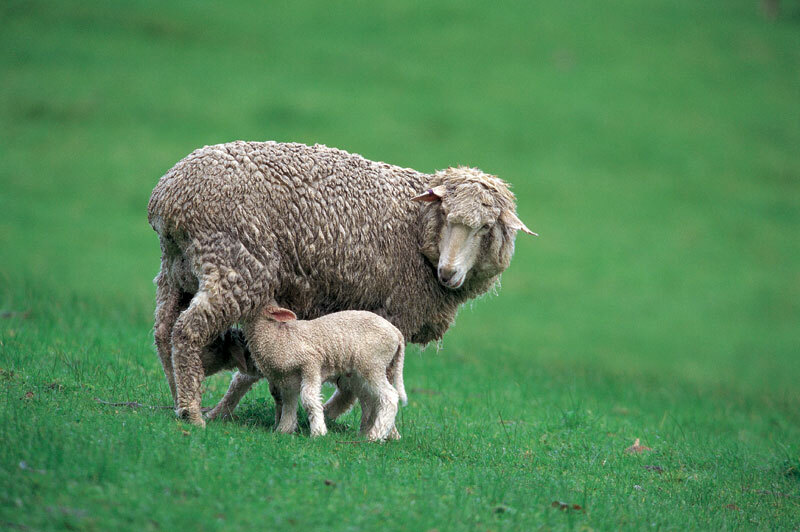 Cute baby lambs prance across hills, turning the three-year-old intoan instant vegetarian, at least for a few minutes. The vineyards are bare of foliage, their arms twisting through exposed frames. We stop here and there on Barossa Valley Way to sample local delicacies and marvel at towns with names we’ve seen at the bottle-o.We avoid large-brand wineries, spendingour time and money on small-scale vintages, preferably from on-farm crops to reduce the greenhouse toll of the wine we buy. 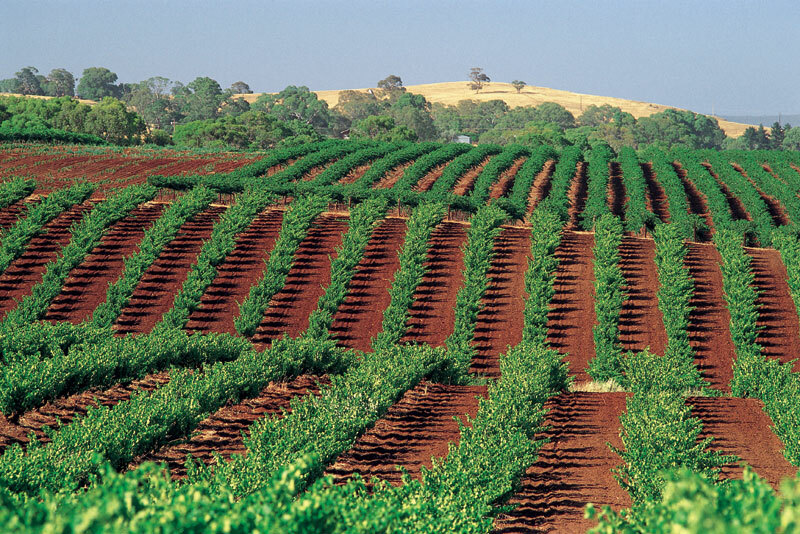 Passing muster is Lou Miranda Estate’s full-bodiedOld Vine Shiraz (2005). It costs more thantheir other fare, but its fruit is sourced on-farm from Lou’s “single-block 100-year-old” vineyard. Delicious. But our true destination is Maggie Beer’s Farm Shop, tucked way up north near Nuriootpa off the famous Seppeltsfield Road. The cookhalf of The Cook and the Chef, Maggie’s also one hell of a businesswoman, using local produce that’s in season to make unique, reasonably priced fare presented in simple, recyclable packaging. There’s not a plastic fork to be seen– the throwaway cutlery is made from bamboo,a renewable resource, and the plates are worn enamel collected, washed and reused. Even the jams and dukkah we buy are handed to us in a recycled paper bag. As we drag ourselves back to Adelaide viathe incredibly boring Sturt Highway, awashwith roadworks and heavy trucks, we decide we can’t face dinner out. We break our pledge and order takeaway curry. I’m sorry, planet! You try going on a wine tour with a three-year-old.I’m surprised we had the energy to eat at all.We console ourselves with the thought thatthe whole Barossa experience used only onebar of petrol on the trusty Prius fuel gauge. Morning comes, and we repeat the towel ritual before heading via Murray Bridge andthe Princes Highway to Robe. In Kingston, we see a giant lobster menacing passing traffic with its huge orange claws. Its promise of crustacean sandwiches begs us to stop, but we are made fools and settle instead for piping hot pumpkin soup and a play gym session for the ankle biter. Robe is a revelation. 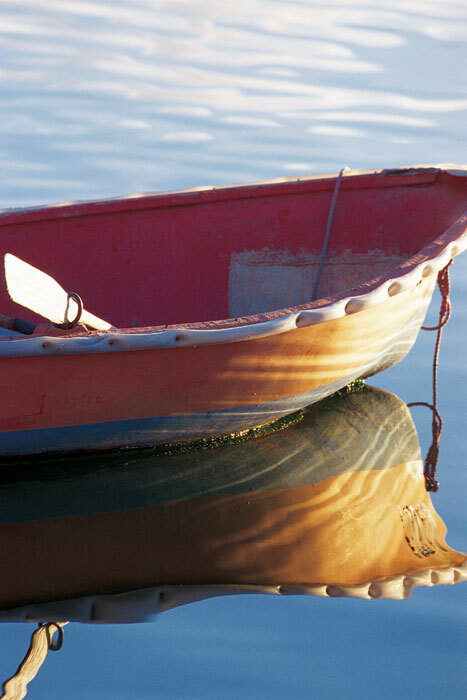 This fishing town is the quintessential seaside hamlet. Glass mansions and restored turn-of-the-century cottages modestly whisper indulgent summer holidays of fresh fish for breakfast and crayfish dinners. We curl our hands around a localred in front of a roaring fire at the historic Caledonian Inn. Heaped $17 bowls of black mussels are melt-in-the-mouth fantastic,almost matched by a hearty serving of the region’s Black Angus beef-and-veg washeddown by a beaut Robe shiraz. The highlight of the night, however, is the unprompted delivery of crayons and a colouring-in book for our pintsized companion. Bravo, more wine please! The next day, with heavy heart (and heads),we say goodbye to Robe. We’d heard the drive from here to Port Fairy was a boring stretchof nothingness, so we prepare for the worst.We are wrong. The landscape is an ever-moving feast, one moment rocky convict country, thenext vast plains of salt-flecked soil, then glimpses of azure sea. I begin to think very differently about the landscape. Livestock become an equation: net benefit (meat/milk/leather) versus environmental cost (erosion, water, emissions). Once boring pine plantations become exciting carbon sink opportunities and a living demonstration of a renewable resource. Appreciation for national parks grows. Rain is a blessing, not a bleeping driver annoyance. I am reconnecting to the land in a new way – intellectually. Instead of just admiring its beauty, I am exploring its feelings, becoming more empathetic and sympatheticto its needs. So, too, do I see the pain of those trying to tame the land. For Sale sign after For Sale sign reveals the treason committed by pastures, their once burnt pallor now green and bustling with new life. Tired of being nature’s playthings, farmers are leaving the land to the wind and sun’s cruel game. Some are adapting. We see giant white windmills rising above hills, around Millicent. At a distance they seem peaceful, waving at us. Closer, their slightly wet-sounding thump distorts birdsong, not exactly off tune butnearly so. We recall the local residents’ protests against their visual impact, and wonder why. To us, they’re beautiful. They give us hope. And then we spy a row of hopeful windmills, background to a huge pile of perfectly goodtrees chipped into tiny pieces, destined to eventually wipe our snot as tissues and our bottoms as toilet paper. It seems a strange hypocrisy. We ponder the human condition. A deep depression, a sinking hopelessness, persists all day on our trek from Port Fairy to Apollo Bay, until nature sends a wake-upcall. 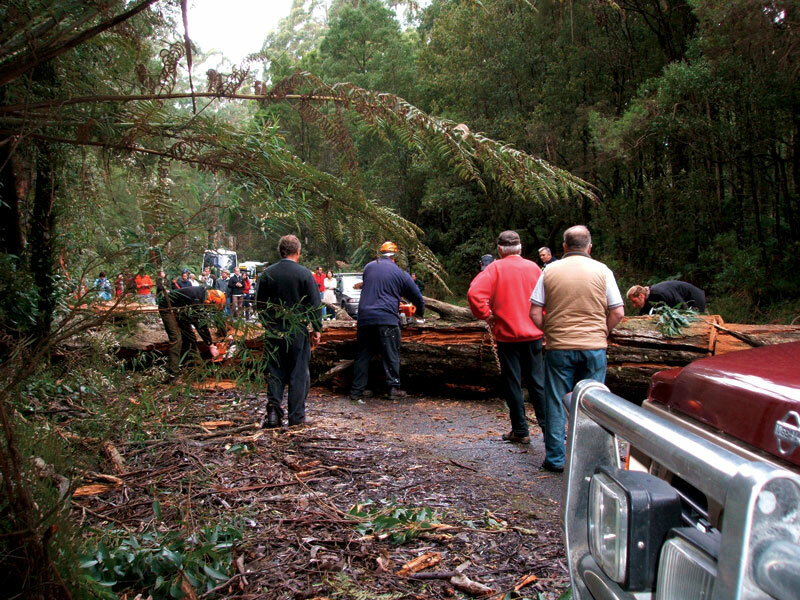 The Great Ocean Road through Great Otway National Park suddenly chokes withcars as a two-metre-wide tree crashes tothe bitumen just behind a packed tour bus. Thirty seconds later and it would havesquashed our little Prius into oblivion. Crowds gather as men with chainsaws appear from nowhere. A sense of community rises as people climb from their cars to talk, swapping near-death stories and marvelling at nature’s fickle hand. We eye the trees suspiciously, now fearing their power. They seem more beautiful, somehow, like thunderclouds. We’re glad to drive out of the rainforest to the top of the mountain. We lose our breath to the sight of the bay, the tiny townships and rolling hills. It’s beautiful. Apollo Bay has to have the most scenic playground anywhere.Even in near-zero temperatures, families lounge on the hand-carved wooden seats, the kids sliding and swinging while adults take in the view. A seal rolls over and waves at us as we walk along the jetty. 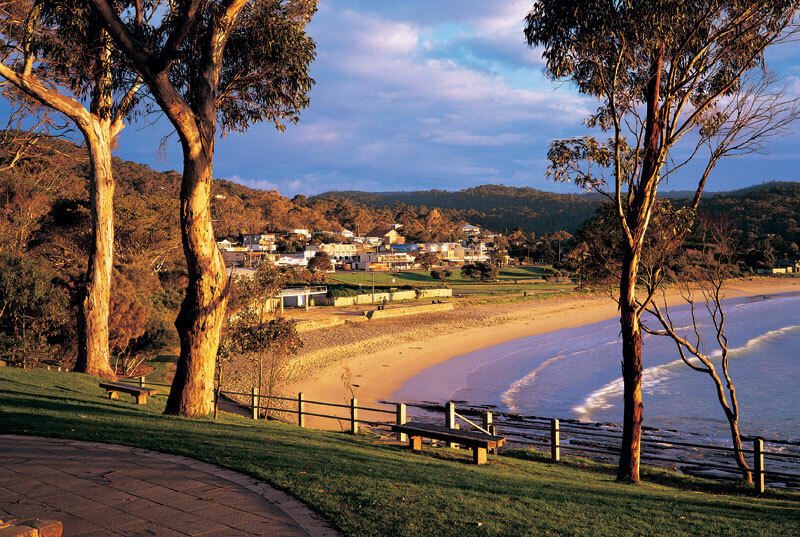 The trusty sat-nav says Lorne – and breakfast – is only a 30min drive. Here lies the failure of machines; they can’t calculate the effect of fear on travel time. The Great Ocean Rollercoaster begins in earnest after Apollo Bay, and the next hour is spent gripping the seat to the sound of “slow down, honey”as the Prius clings to cliff sides, the engine roaring to compensate. The wild coast,flag-blue, breaks white on rocky beaches. Lorne, with its shiny cafe strip andtrendy resorts, feels like Melbourne by the sea. Everyone has that well-dressed, cool haircut, great skin look. It makes sense; this surely isthe southern playground for city weekenders, and even now, in the quieter months, thelittle town is busy. We wind our way along the final stretch of coast until, too soon, we’re again surrounded by pasture and trees, morphing to light-industrial, then Geelong proper, and finally a long stretch of highway straight into Melbourne’s heart.It’s only at the bottom of Collins Street thatour driving fear returns. Sunday afternoon and the city is chaos. Suicidal hook turns confuse, as daring taxis dart across tramlines to do u-turns into packed streets. One becomes stuck and misses a tram by inches. Horns blare, fingersare raised, and 45min later we finally find the sanctuary of the Sofitel Melbourne on Collins. My poor husband is a wreck. We return thecar a day early and vow never again to drivein Melbourne. And as we sit at Queen Victoria Markets, each chomping on a German-sausage-in-a-bun, we take stock of our great journey into sustainability. Surprisingly, we only spent $90on petrol for our 1008km trip in the Prius,after receiving the car with a full tank. True,we didn’t do too well on the reducing rubbish stakes, but we did okay – a takeaway count of four plastic containers, four plastic drink bottles, plus a couple of glass bottles. The biggest garbage traps were the hotel room toiletries. So much waste and packaging just to wash our handsand hair. Next time, we’ll take our own supplies. But, did we have fun? You betcha. Thinking about our consumption was a bit of a drag, but it was also an interesting, challenging exercise that taught us a thing or two. And that’s the point of all travel, isn’t it? You missed going to the 2 greenest places along the Great Ocean Road. At the Cape Otway Centre all their power is by solar at a place they built themselves and then Aire Valley Restaurant where all their vegetables and salads for the restaurant are grown in the organic garden and picked just before you eat them. I wandered around the garden while my dinner was being picked. Amazing. 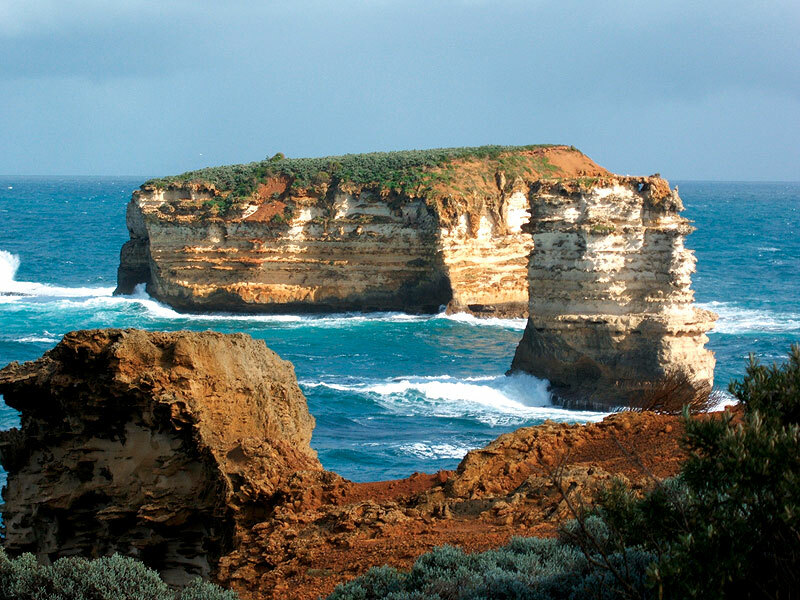 There is no other place like these 2 along the Great Ocean Road.